Designing gardens that celebrate and 'fit' the surrounding Mississippi natural landscape is a desire of many homeowners and educators. 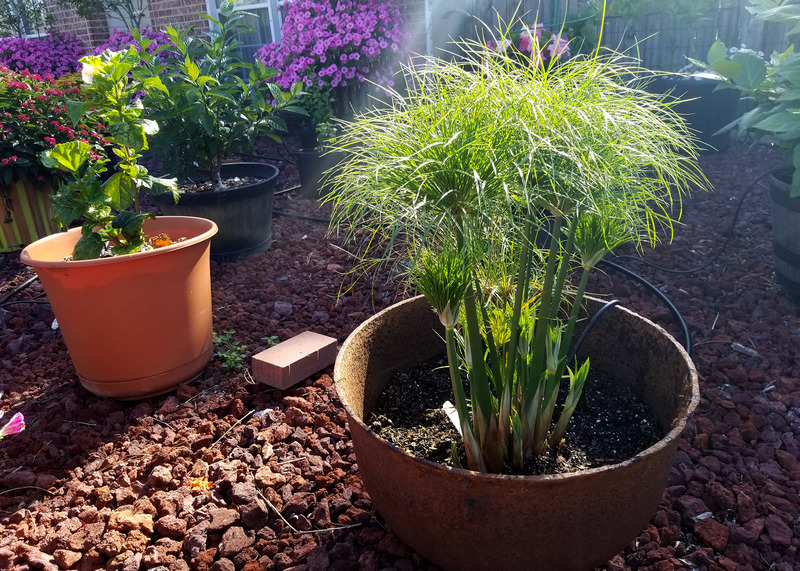 Using native plants in the garden offers many benefits including best adaptability to local soil and climate conditions, maintaining food plants and shelter for local wildlife, the conservation and propagation of local flora types, and creating a sense of place that is unique to our state. Just as there are many plant species that are native to our region, there are many approaches that can be used to incorporating native plants into private and public gardens. The American Heritage Dictionary defines naturalistic as 'imitating or producing the effect or appearance of nature,' and is commonly seen in garden design. Introduced to the United States by Frederick Law Olmstead at the beginning of the twentieth century, this landscape design approach uses primarily native plants in a non-formal manner, but freely includes exotic ornamentals (see Figure 1). This concept differs significantly from ecological restoration, which the Society for Ecological Restoration defines as 'the process of assisting the recovery of an ecosystem that has been degraded, damaged, or destroyed.' This method restores the native plant species and compositions that previously existed on the site (see Figure 2). The degree of native plant community composition used for a project depends upon the context and design intent for a landscape. 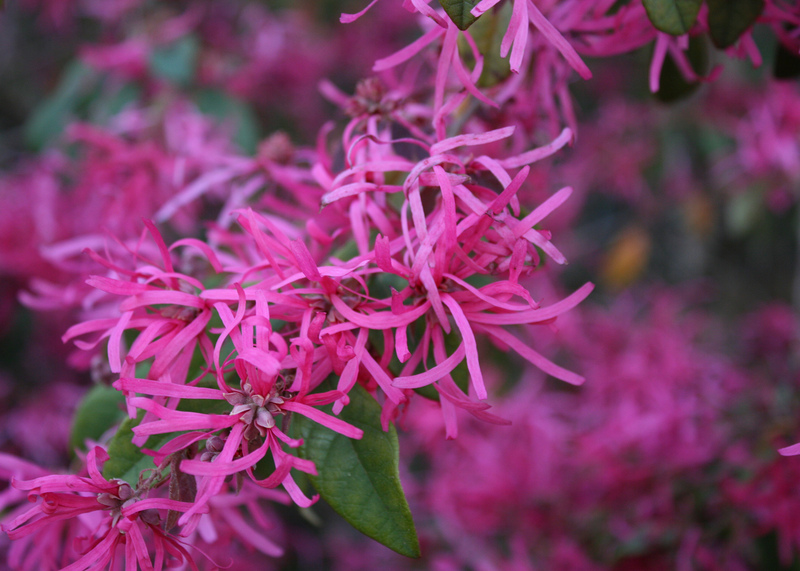 Chances are you already have a fair number of native plants on or around your property. Preserving existing patches of native woodland, wetland, or meadow areas is the best way of conserving native plants on properties. Allowing existing disturbed areas such as lawns, fence lines, drainage ways, or cleared sites to 'grow up' into a woodland type is another viable and inexpensive way of establishing a woodland system. Or, designing and planting a native plant garden may be best for certain sites. Your decision depends upon the context of the site and what your ultimate goals are for the garden. There is a misconception that using native plants in landscapes should look like a natural woodland or prairie, which may be perceived by some as being unkempt or not maintained. However, native plants are utilized just as any other ornamental garden plant, and may be incorporated into existing garden types or even formal designs. How native plants are physically arranged in the garden usually does not impact their ecological value. If you are interested in a 'natural' appearing landscape, your best source of inspiration is your local woodlands. Observing and noting the plant species growing there allows for a ready list of plants that may be suitable for your site. Some communities have local native plant chapters, conservation organizations, or biologists that offer native plant hikes. Or, visiting a park in your region that has nature trails or native plant gardens is another good way of learning information. Nurseries and garden centers that offer native plants may have knowledgeable personnel that may assist you. The recognition of a few key ecological principles may assist your planning efforts. These include understanding the topography (elevation levels or relief of the land) and hydrology (moisture levels, or where water flows) in your landscape. Other key points include understanding woodland succession (ages of a forest community); physiographic regions (the unique climate and geographic conditions of an area), and forest community types (differing plant communities). Topography is the elevation or slope of the land. Your property may be located on the top of a hill, along a slope, or at the bottom of a flat area--or it may contain all of these conditions. Some tree species, such as sweet gums or loblolly pine, may readily adapt and be suitable to all of these conditions. Others, such as dry tolerant plants including blackjack oak and post oak, may perform best on the tops of hills than in wet drainage ways. Likewise, sweetbay magnolias and sweetspires do best in moist environments as found in lower bottoms. 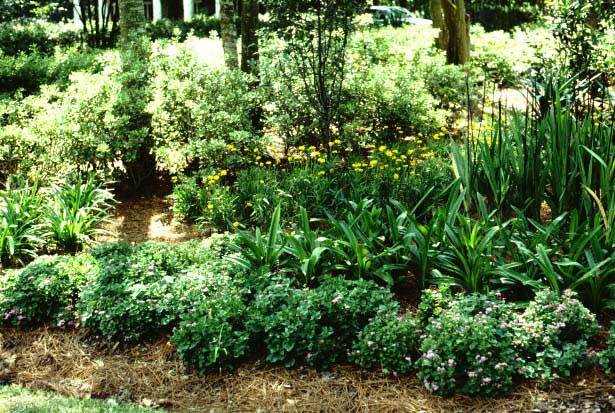 When selecting native plants, it is best to research which moisture conditions are preferred by certain species. A casual drive along your street may reveal the elevation level of your property in your neighborhood, which can be determined by looking for the highest or lowest points. Or, you can find the elevation of your property on a topographic map, available in most libraries or on publicly available Web sites such as Topozone (http://www.topozone.com). The elevation of your property directly correlates to the available moisture levels of the soil. Ridgetops are called xeric (dry) sites, and bottomlands are known as hydric (wet). The slopes along a hill can be divided into upper and lower mesic (moist) soils (see Figure 3). Understanding a garden's or property's moisture levels may best determine the plant types that will be most successful (see Figure 4). 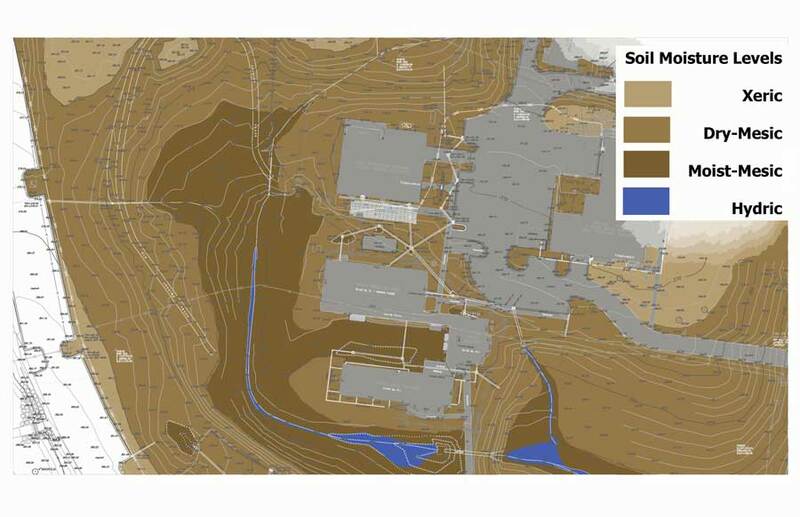 By using a property plan of your site, you can delineate where the xeric, mesic, and hydric zones occur (see Figure 5). Knowing your soil type is equally valuable to understanding which plants may perform best in your garden. Soils vary considerably across the state and may best be understood by having a soil test conducted through the Mississippi State University Extension Soil Testing Lab. For a modest fee, submitted soil samples will be analyzed for their composition, which is best collected in each of the elevation zones. You may also find general soil information about your property in your county's Soil Survey guides. Available from your local Natural Resource Conservation Service office (NRCS), the guides contain aerial photographs of each county in the state with soil associations identified upon them. There is additional information about each soil type and their physical and chemical properties. In the eastern United States, the natural plant progression from a mown or cleared site to a mature woodland stage is termed succession. An abandoned agricultural field begins with annual and perennial grasses and herbaceous plants (such as broomsedge, goldenrod, asters, and daisy fleabane) that predominate in the first few years. Emerging shrubs and trees will germinate and a dense woody thicket replaces the herbaceous cover. Pioneer trees such as pine, sweet gum, and red maple will form the first canopy of the young woodland. 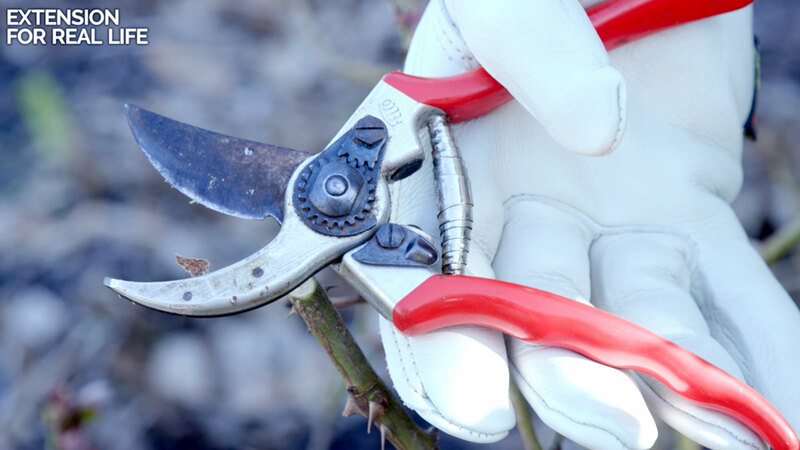 As shade increases from the trees, sun loving shrubs will begin to die out and be replaced by shade tolerant shrubs, trees, and groundcovers. Trees that are able to germinate and grow in shaded conditions, such as southern magnolia, oaks and American beech, will eventually replace the pioneer tree species. Mature woodlands, also known as climax forests, can stabilize after 150 years of growth. Climax forests in Mississippi include beech-magnolia (mesic); post oak-hickory (xeric); and cypress-tupelo-gum (hydric) forest community types. Due to the frequency of hurricanes, ice storms, periodic wildfire, logging, and other disturbances in our region; climax forests are not predominant in the state. Mature woodlands most often have defined vertical stratification layers to the forest. These vertical layers are shrubs and trees with mature heights that take advantage of open areas within the upper canopy. Southern woodlands are composed of upper and lower canopy trees (such as red oak, white oak, or pine); upper and lower understory trees (dogwood, redbud, musclewood); shrub levels (wax myrtle, hollies, beautyberry); herbaceous layer (ferns, grasses, and perennials); and the forest litter layer (fungi, mosses, lichens). 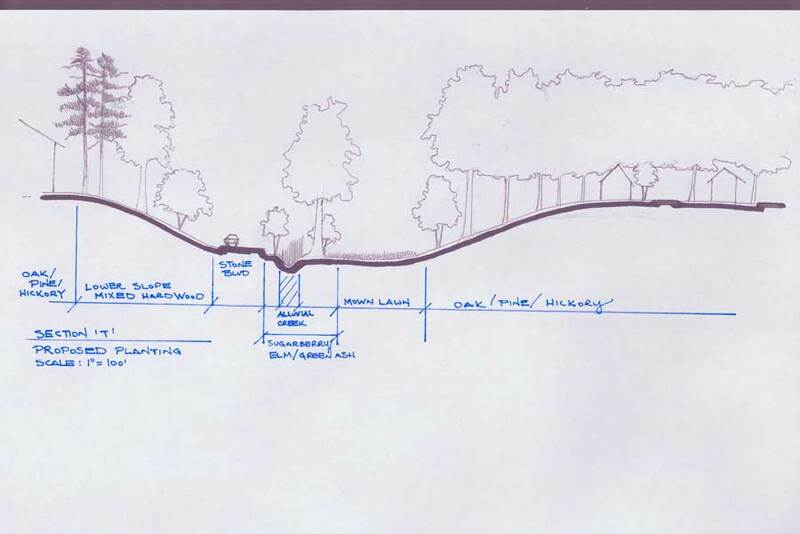 When designing woodland plantings, especially when providing bird habitat, the presence of each of these vertical forest layers becomes important. Properties and gardens should be evaluated as to the successional stage they are currently in. Wildflower gardens and meadows are appropriate to establish in sunny open sites. If the intent is to create a woodland environment, selecting and planting pioneer tree and shrub species will usually result in quicker woodland establishment as many of these species grow faster than many older woodland plants. As shade levels increase, shade tolerant woodland species may be added. Although many native plant species occur throughout much of the state, some are specific to a region's unique soils, climate, or rainfall levels. 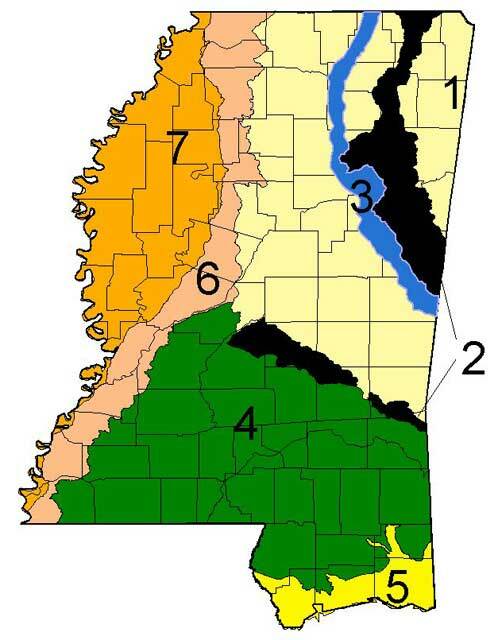 Mississippi has distinct physiographic regions that are influenced by geology and climate (see Figure 6). For more information on the descriptions of these areas and the typical plant species encountered see Plants of Mississippi by Lowe (1921), or Wildflowers of Mississippi by Timme (1989). A forest community alliance, or plant community, is a group of plants that interact to inhabit an area. While there may be variation in the types or dominance of plants found in these communities, they serve as a rough association that tends to occur throughout the state. The names of plant communities, such as Longleaf pine-Blackjack Oak forest or Beech-Magnolia forest refers to the predominant canopy trees of these woodland types. While a forester or biologist may be your best source of information about the plant species of particular woodland types, there are a few public Web sites that provide general, yet useful, information about ecological communities in our state. Natureserve Explorer (www.natureserve.org) offers a searchable database of forest community alliances for the southeast region. Descriptions of the plant communities and their associated species may be found. The Mississippi Department of Wildlife, Fisheries, and Parks also has an excellent listing of Mississippi's plant communities in their report entitled Comprehensive Wildlife Conservation Strategy. Available to the public on their Web site (http://www.mdwfp.com/Level2/cwcs/Final.asp), the report lists critical wildlife habitat types and subtypes, and their associated management, plant species, and conservation statues. 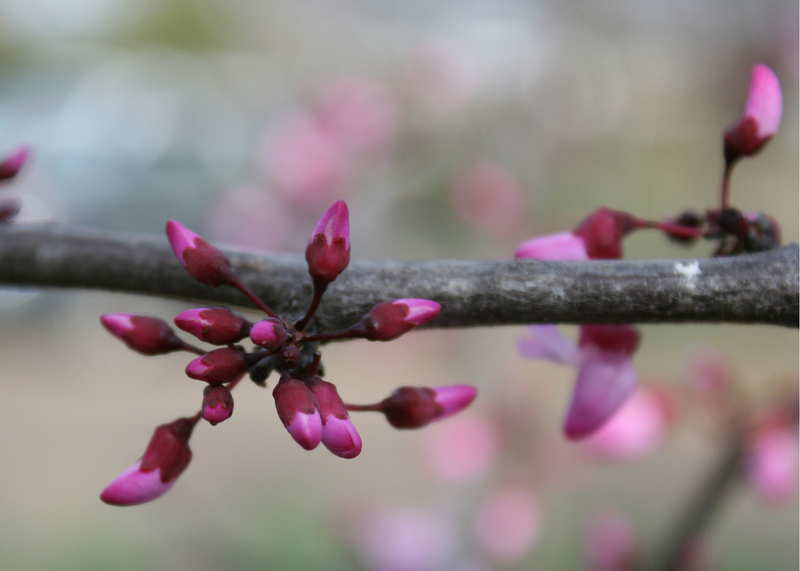 Additional information on select native tree and shrub species for Mississippi may also be found in MSU Extension publications. Native Trees for Mississippi Landscapes, Publication 2330, and Native Shrubs for Mississippi Landscapes, Publication 2334. With an understanding of the topography, hydrology, woodland succession status, physiographic region location, and forest community types present on your property; you will have a good idea of what plant species are best adapted for your site and where to place them. Finding native plant species that you are interested in is always a challenge. 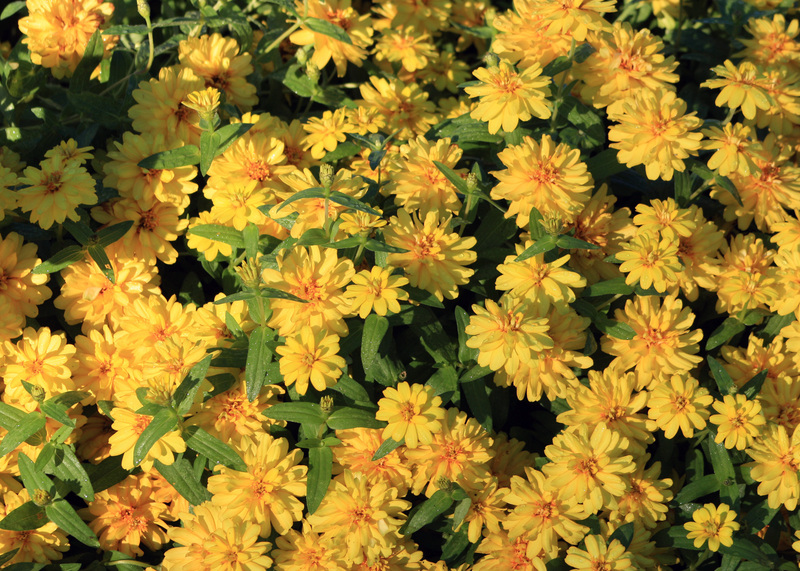 Check with your local garden center for availability or ordering of native species. Public gardens and arboreta often carry or provide native plant species at plant sales and plant swaps. A wealth of native plants for the southeast can be ordered through nursery internet sites, yet locally produced plants are preferred for local genetic adaptability. 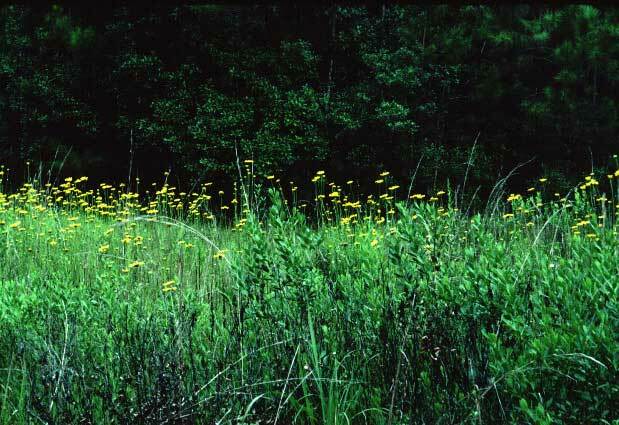 For more information on the identification and recommended control measures for invasive exotic weed species in the southeastern U.S., visit the Southeast Exotic Pest Plant Council Web site at (www.se-eppc.org). 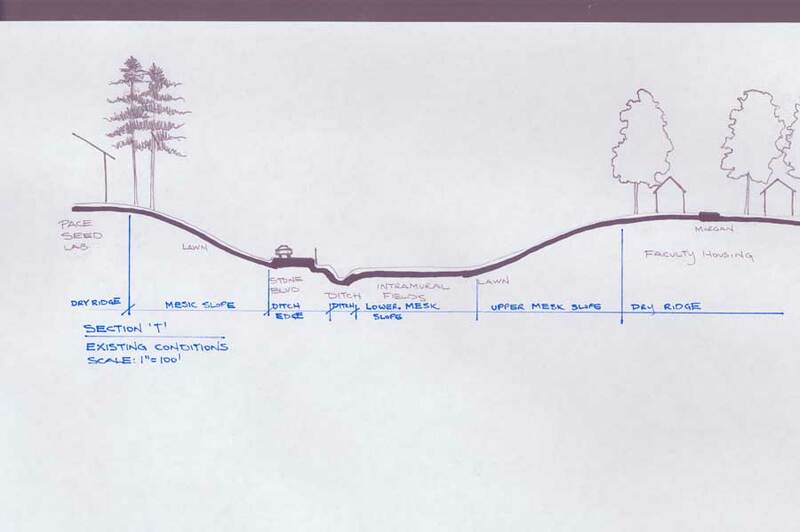 The acceptance of native plant garden approaches varies upon the context of the garden site. Some communities have weed laws that prohibit the height of vegetation on properties and native plantings may be misconstrued as weedy vegetation. 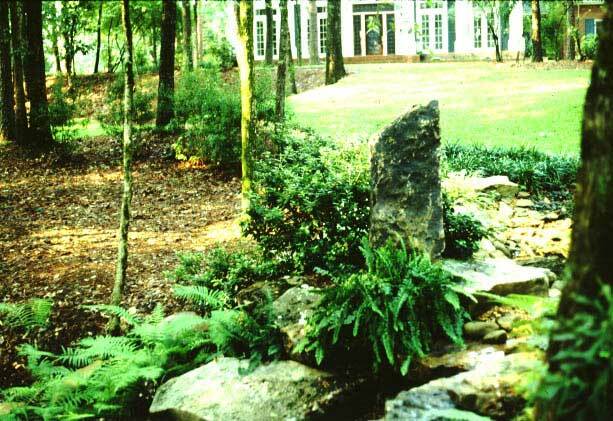 Always check your local ordinances for regulatory language before beginning any native garden installation. 1. Define the edges. The addition of a split rail fence, border edging, shrub edge planting, or other structures that provide a frame around the native plantings will help to identify and define the area as a special planting site. 2. Include some architectural or permanent features in the planting area. The addition of bird feeders, large decorative stones, paving materials, bird baths, plant identification signs, benches, or other features of interest provide a human element that people can understand (see Figure 7). Sculptures offer a permanent structure that contrasts well against the changing colors and features of native grasses, wildflowers, and vines. 3. Educate your neighbors to the values of using native plants. Sharing is one of the best ways to encourage heritage landscapes. Show your neighbors how birds are using the area for nesting and feeding, give them cuttings and divisions of plants that they can use in their gardens, and encourage them to bring children over to wander through the garden. Education is a key element to understanding, especially in public landscapes.